I really like this pattern and used Black Corduroy fabric. I’m still a newbie to using patterns but I really enjoyed the ease of following this one as it was very well illustrated. I will be making this again soon but will be adding some form of embellishment. My second finished project a scarf for the EbonyElite Sistah Friends group on Ravelry and I can’t display it just yet but I will post it here after the first week in Feb. to insure the reciepent has had a chance to open the box of goodies. This was really fun and it brought about something new for me that I’ve yet to experience in my knitting and it is planning and execution of my projects. I have never really knitted on a specific time frame and this got me to thinking that setting a time frame and sticking to it is likely to produce more FO’s in 2008 than what I did for 2007. This also brings me to an UFO that has been on the needles for the past ohhhhh maybe 6 months now and it’s my Green Gable. Since that was cast-on I have made the following items: 2 baby quilts, 1 skirt, 1 girls dress, 2 pair of footies, 1 hat, 2 Calorimetry head warmers, 3 I-pod cozies, 2 scarves, and a Queen size quilt in the quilting stage. Now I realize when looking back at all of this my Green Gable could have been bound off and happily galavanting around recieving raved reviews but it’s been patiently waiting by the bed for all this time and it now gets my full…..well no, it can’t get my full attention because I also signed up to knit a pair of socks each month in the 2008 Sock Log on Ravelry and have yet to cast them on. So I just don’t know when this poor sweater will ever get off the needles. I would like to say that my 2 hour skirt is now complete here are some pics and then I’ll share what I thought about the process. This is Simplicity Pattern 4881 I did view D. I had been saying view F but that included a ruffle on the 2 front seams and that’s just not me. I was really worried about this coming out right and hence a pretty simple skirt turned into a trial for me. I say a trial because this is the first time I’ve sewn for myself and have yet to discover my “pattern size” to make the correct choices for myself. I choose this pattern because I liked the idea of using a lightweight wool to make a skirt that would show off the drape of the fabric and be good for winter wear. having 8 pieces that made the skirt too big for me and I wasn’t sure how to make the proper adjustments and still get the right fit. So I downsized to 6 pieces. You should take the time to make a muslin when you’re unsure of a pattern and it’s components. To insure a proper end result. Patients is the best teacher and rushing a project is just a plain waste of time. I’m glad that I took the time to read and re-read the pattern and some of the resource material that was on hand. What I will do differently next time. I will pick a project that is a little easier so that I can get the hang of sewing for my figure and learn more about adding adjustments to patterns for my body type. Will I sew this skirt again…….Yes, I will and it will be one of my favorites I think so far but I will definitely use another fabric type. 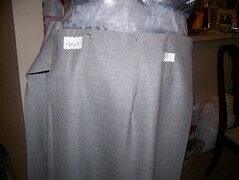 something more flowing and if I do use wool or linen I will do a zipper and waistband style for a more tailored finish. In knitting, I’m at a point where there are 3 projects on my needles right now. I still haven’t made any progress on my Green Gable since finally getting my waist together so it’s just sitting by waiting. My scarf that was going to be a Christmas present is still on the needles and may be ripped out and made into something else that decision is still in the air. Then there’s the Secret Project that’s such a secret this is the first I’ve spoken about it on my blog is coming along very nicely and I can’t wait to post pics and talk about the pattern I’m using. It is turning into a pattern I will be using alot for many different things especially some socks as soon as I figure out how to adapt a stitch pattern into garment. There’s so much to learn. Well, this week I decided to add another class to my 12 credit hours I’m already taking to change my completion date to September ’08 instead of December. This was a big decision but I had to look at the money issue and I will soon need to have a full-time job instead of just working part-time. I’ve been very fortunate to have a little cushion and all but with a Senior in high school and all the activities that come along with that and impending college there’s just some extras I’d like to be ready for. With all that said I’ll be lurking here and there but knitting will still be going on since it’s portable and I’m not sure about my sewing but I have made a vow to allow at least 4 hours per week to it so we’ll see what happens. 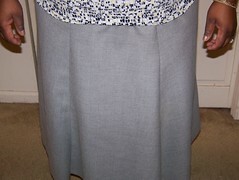 There has been progress on the supposedly 2 hour skirt from Simplicity. Don’t get me wrong I’m sure for a more experienced sewer it would take 2 hrs. or less but for me a girl who is use to sewing for my daughters it’s a jump working with my womanly figure and trying to instruct someone else how to fit you adds to the challenge. So far the following changes have been made it was an eight panel skirt which has now been cut down to 6 with an invisible zipper to be placed on the side of the the skirt I think the pattern calls for this to be an elastic waist skirt but we’ll see after I baste the front and back together. I love the color and the drape of the fabric so I’m still excited about the process and already know once I have this completed there will be more. What you have here is my Christmas loot to myself from BMFA in the following: 2 sks. 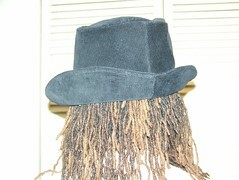 STR Silkie in Walking on the Wild Tide, 1 sk. STR Silkie in Sun Stone, 1 sk. Mediumwtg in Thistle and 1 sk. mediumwtg in Jade. I realized that I hadn’t used my coupon that was included in the STR Club ’07 and no true yarnnie would let a perfectly good coupon for 10% off go to waste. Well my new quarter begins tomorrow and after this I have 2 more quarters and then my externship and I’ll finally be out of school. I’m very proud of myself for finally taking the opportunity to return and get a degree. I was chatting with one of my long-time friends who just went back to school last year and we were discussing the major changes in our lives now that we’re 40 yrs. old. Being from Ohio, which for many years has been a booming manufacturing haven, businesses are quickly leaving and thousands of us over the past 4 years have lost our jobs. We began to remember how easy it use to be to get a good job just based on work experience along. Now we both noticed, as I’m sure some of you may too, that you have to have a degree or trade certificate just to get a second look if you expect to come up on a job that pays over $10.oo per hour. I’m not complaining, as I have been very blessed to accomplish a lot of things in the past year. There are just times that you stop and reflect back and that to me brings opportunity for being grateful for where you are and not where you could be without hope. I’m currently working on my skirt Simplicity Pattern 4881 View F. I took my measurements and then looked at the measurements on the back of the envelope and knew that I had to call in reinforcements. I’m new at this and I didn’t want to waste my fabric on costly mistakes. 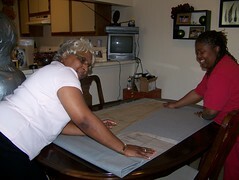 So my Mother came to my rescue and helped me make the adjustments and properly layout and prepare my fabric. After we made the measurements and traced them onto the pattern paper we measured again and then added to the pattern paper to make a permanent pattern for future use. I remembered a recent show of Sewing with Nancy where she talked about labeling your pattern pieces so that you will not have any problems when it’s time to piece them together so I did that too. 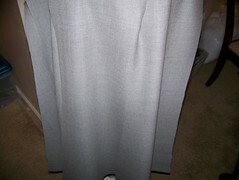 This is the drape of the fabric that I think looks really good and makes me glad that this fabric was chosen, which is lightweight wool blend in grey. I will be adding black piping I think it’s what I see in my head and hope it comes out nicely. So far after getting that all done, my outlook on sewing is that a good job isn’t a rush job. It pays to take your time and get the correct measurements and make sure you give yourself room for adjustments. If you cut you pattern without ease you set yourself up for potetial problems later. At least for a beginner like myself that was the case. 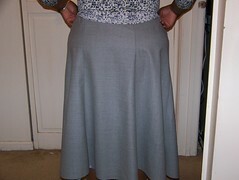 Again I’d like to thank my Mother for coming to my rescue and I can’t wait to model my new skirt. In 2007 I joined 2 sock clubs; Sundara’s Petal Collection and Blue Moon Fiber Arts STR Club ’07 I only made 3 pairs of socks but I did gain knowledge in toe-up construction and I learned the ML (magic loop) method. I discovered new Podcast for sewing that introduced me to Cidell, Trini, Carolyn, Adrienne and a few other sewing divas. This discovery has prompted me to get serious about creating a wardrobe for myself and really increase my sewing skills. I have become dedicated to time management to include my personal interest in my crafts and to hopefully gain some clientele. I also want to promote my youngest DD’s talent for design by learning how to put pattern’s to her designs. 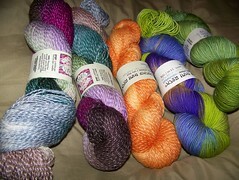 I look forward to having more FO’s in my knitting, quilting and sewing in the new year. Doing more projects promotes learning, increases self satisfaction, and adds to my wardrobe all the while letting others view your talents. There’s still so much I have to learn but I just want to thank all of the expert knitters, sewist, and quilters for sharing your experiences with a advanced beginner like myself. 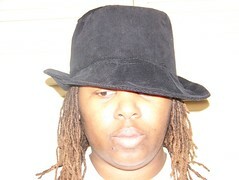 I hope to reach a higher level in 2008 and reclassify myself as an intermediate crafter at the end of this year. 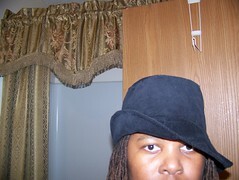 Stay tuned, drop me a line, give me your honest opinion, and see how I grow. May you have a wonderful, blessed and prosperous year.